On Monday, a hacking group calling itself the “ShadowBrokers” announced an auction for what it claimed were “cyber weapons” made by the NSA. Based on never-before-published documents provided by the whistleblower Edward Snowden, The Intercept can confirm that the arsenal contains authentic NSA software, part of a powerful constellation of tools used to covertly infect computers worldwide. The provenance of the code has been a matter of heated debate this week among cybersecurity experts, and while it remains unclear how the software leaked, one thing is now beyond speculation: The malware is covered with the NSA’s virtual fingerprints and clearly originates from the agency. SECONDDATE plays a specialized role inside a complex global system built by the U.S. government to infect and monitor what one document estimated to be millions of computers around the world. Its release by ShadowBrokers, alongside dozens of other malicious tools, marks the first time any full copies of the NSA’s offensive software have been available to the public, providing a glimpse at how an elaborate system outlined in the Snowden documents looks when deployed in the real world, as well as concrete evidence that NSA hackers don’t always have the last word when it comes to computer exploitation. The NSA did not respond to questions concerning ShadowBrokers, the Snowden documents, or its malware. The offensive tools released by ShadowBrokers are organized under a litany of code names such as POLARSNEEZE and ELIGIBLE BOMBSHELL, and their exact purpose is still being assessed. But we do know more about one of the weapons: SECONDDATE. SECONDDATE is a tool designed to intercept web requests and redirect browsers on target computers to an NSA web server. That server, in turn, is designed to infect them with malware. 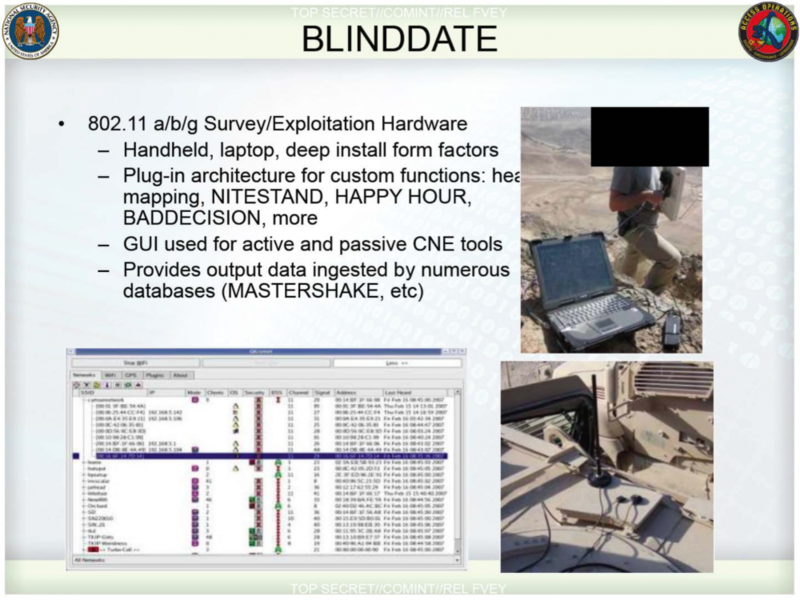 SECONDDATE’s existence was first reported by The Intercept in 2014, as part of a look at a global computer exploitation effort code-named TURBINE. The malware server, known as FOXACID, has also been described in previously released Snowden documents. Other documents released by The Intercept today not only tie SECONDDATE to the ShadowBrokers leak but also provide new detail on how it fits into the NSA’s broader surveillance and infection network. They also show how SECONDDATE has been used, including to spy on Pakistan and a computer system in Lebanon. All told, throughout many of the folders contained in the ShadowBrokers’ package (screenshot below), there are 47 files with SECONDDATE-related names, including different versions of the raw code required to execute a SECONDDATE attack, instructions for how to use it, and other related files. After viewing the code, Green told The Intercept the MSGID string’s occurrence in both an NSA training document and this week’s leak is “unlikely to be a coincidence.” Computer security researcher Matt Suiche, founder of UAE-based cybersecurity startup Comae Technologies, who has been particularly vocal in his analysis of the ShadowBrokers this week, told The Intercept “there is no way” the MSGID string’s appearance in both places is a coincidence. This overview jibes with previously unpublished classified files provided by Snowden that illustrate how SECONDDATE is a component of BADDECISION, a broader NSA infiltration tool. SECONDDATE helps the NSA pull off a “man in the middle” attack against users on a wireless network, tricking them into thinking they’re talking to a safe website when in reality they’ve been sent a malicious payload from an NSA server. 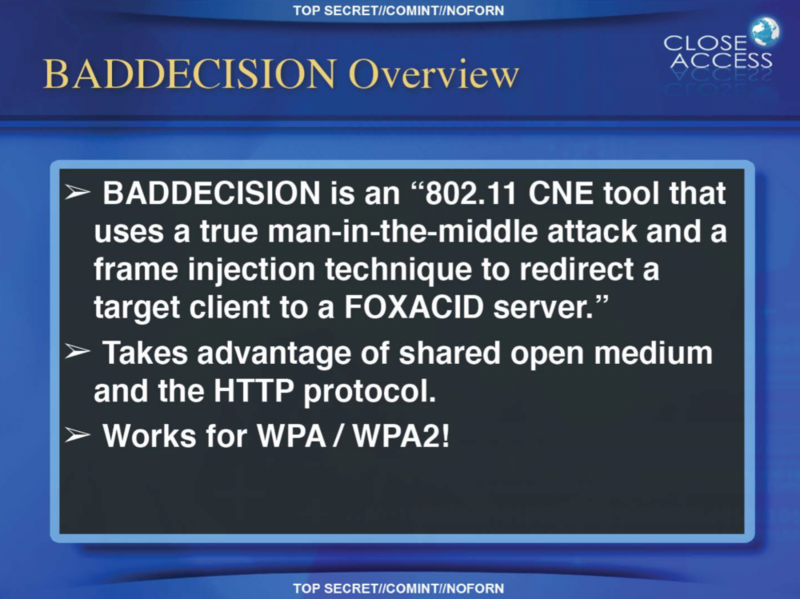 One slide points out that the attack works on users with an encrypted wireless connection to the internet. The sheer number of interlocking tools available to crack a computer is dizzying. In the FOXACID manual, government hackers are told an NSA hacker ought to be familiar with using SECONDDATE along with similar man-in-the-middle wi-fi attacks code-named MAGIC SQUIRREL and MAGICBEAN. 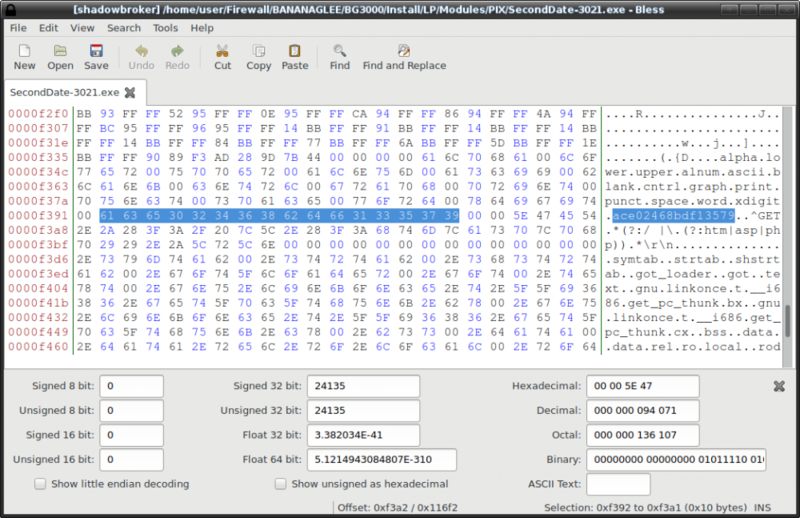 A top-secret presentation on FOXACID lists further ways to redirect targets to the malware server system. In the latter, the NSA used SECONDDATE to pull off a man-in-the-middle attack in Lebanon “for the first time ever,” infecting a Lebanese ISP to extract “100+ MB of Hizballah Unit 1800 data,” a special subset of the terrorist group dedicated to aiding Palestinian militants. 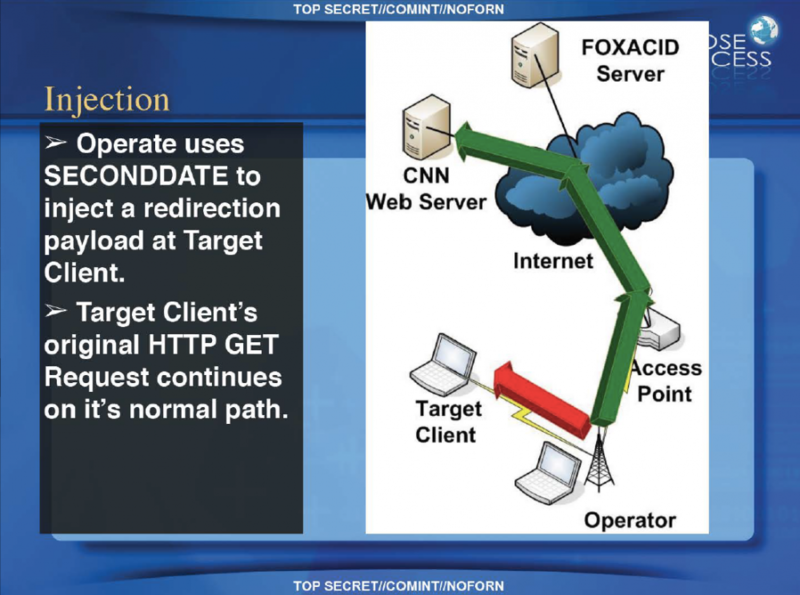 SECONDDATE is just one method that the NSA uses to get its target’s browser pointed at a FOXACID server. Other methods include sending spam that attempts to exploit bugs in popular web-based email providers or entices targets to click on malicious links that lead to a FOXACID server. One document, a newsletter for the NSA’s Special Source Operations division, describes how NSA software other than SECONDDATE was used to repeatedly direct targets in Pakistan to FOXACID malware web servers, eventually infecting the targets’ computers. Snowden, who worked for NSA contractors Dell and Booz Allen Hamilton, has offered some context and a relatively mundane possible explanation for the leak: that the NSA headquarters was not hacked, but rather one of the computers the agency uses to plan and execute attacks was compromised. In a series of tweets, he pointed out that the NSA often lurks on systems that are supposed to be controlled by others, and it’s possible someone at the agency took control of a server and failed to clean up after themselves. A regime, hacker group, or intelligence agency could have seized the files and the opportunity to embarrass the agency. Next Next post: Which Items Will Disappear First During A Major National Emergency?